I made this card with an image that I won from the Digi Shack. I entered last week's Jazzy Inspirations challenge and was randomly chosen to win $15 worth of Digi Shack images! Woo hoo! I thought this guy was cute. 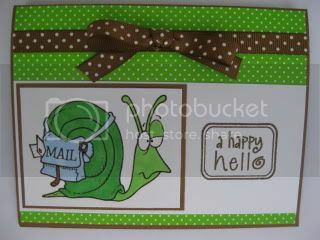 He's called "snail mail". I colored him with my Copics and used the color combo from SPCC Color Combo challenge which was brown, white and lime green. Thanks for joining us at SPCC. I love your use of the colors, and that little guy is sooo cute! That is too cute!! I love the little snail! What a cute snail. Great job with this weeks color combo. How cute is he! I love this color scheme, I seem to be into greens myself lately. Love the card! What a cute little snail. I love "snail" mail. Thanks for playing this week at SPCC! Congratulations on winning those digi stamps! that snail is too cute! glad you could join us this week at SPCC! LOVE the polka dots! cute image too! Cute cute cute - I love that stamped image. That image is so cute, I love how you colored it!! That snail is the best! I love it!